Happy Easter Everyone! Our offices will be closed for Good Friday-19th April and Easter Monday-22nd April. Any orders placed after 2pm on Thursday 18th will be processed on Tuesday 23rd. Our website will remain open for business. Welcome to our 250 Gram Gold Bars section. 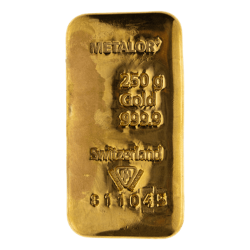 We currently offer the widest choice of Gold Bars available in the UK. Our products are guaranteed for weight and purity, produced by the leading Global manufacturers and are brought to you at the keenest prices. Can't find what you're searching for? Call our Sourcing Team on 01902 623 256. © 2018 UKBullion. All Rights Reserved. The opinions of UKBullion.com, its employees, agents or directors should not be relied upon as any implied or explicit guarantee of return. We are not authorised or regulated by the Financial Conduct Authority to provide any investment advice.